Fred. Olsen Cruise Lines is delighted to announce that the inspirational former jockey and Grand National winner, Robert ‘Bob’ Champion MBE, will be joining its acclaimed cruise enrichment programme, Vistas, as one of its ‘Sporting Personalities.’ Bob will be speaking about his amazing life on board Boudicca cruise D1202, a 35-night ex-UK voyage to the Caribbean and Cuba, departing from Southampton on 19th January 2012. Born in Yorkshire in 1948, Bob Champion became a leading jump jockey, whose most memorable victory was wining the Grand National in 1981. His triumph was all the more impressive because he had previously battled testicular cancer, and fought his way back to health. His victory, riding ‘Aldaniti’, has become the stuff of legend, and a film, ‘Champions,’ was made of his life, with John Hurt in the title role. Following his own experience with cancer, Bob set up ‘The Bob Champion Cancer Trust’ in 1981, and has since raised millions for cancer research; in 1982, he was awarded an MBE in the Queen’s Birthday Honours. In December 2011, Bob was awarded with the ‘Helen Rollason Award’ in the 2011 ‘BBC Sports Personality of the Year’. On this exotic ‘Caribbean and Cuba’ cruise, the Atlantic crossing is broken by a call into the Canary Island of Tenerife, before Boudicca begins her odyssey of the Caribbean islands. Her ports of call are a roll call of idyllic destinations – the islands of Barbados and Curaçao, then Cartagena in Colombia, and Colonin Panama, before reaching Montego Bay on the colourful ‘reggae island’ of Jamaica. The next port is a highlight of the cruise – an overnight stay inHavana, Cuba, a port steeped in history and romance. Two more Caribbean islands complete this part of the itinerary – Turks and Caicos, and the tiny island of St. Maarten – before Boudicca begins her return voyage to Southampton, broken by a last call into Ponta Delgada in the Azores. This cruise has a host of added attractions, in addition to its superb itinerary. Joining Bob Champion are three other renowned ‘Sporting Personalities’, ex-footballer and former Manager of both Spurs and Arsenal, Terry Neill, and the former darts champions, Keith Deller and Cliff Lazarenko, who will be entertaining guests throughout this cruise. Additionally, there are two further Vistas themes of a very different nature – ‘Pottery’ and ‘Handicrafts’. This cruise is also part of Fred. Olsen’s renowned programme of live entertainment, Music & Laughter, the theme of which is ‘Smooth Pop & Soul’. Guests will be treated to live performances by popular soul singer, Irie J, and one of the best tribute bands in the business – Abba Magic. There is no extra charge for taking part in either Vistas or Music & Laughter. Fred. 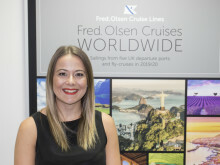 Olsen was named ‘Cruise Line of the Year’ at the first-ever ‘Cruise International Awards’ in 2011, as well as being voted ‘Best Educational Cruise’ for Vistas, and ‘Best Live Performance’ for classical duo, The OperaBabes. The cruise line also received a ‘Highly Commended’ in the ‘Best Value Cruise Line’ category.